This entry was posted on December 16, 2018 by Woven Monkey. We're almost ready to open the mulled wine so its time to tell you our opening hours over the festive period. 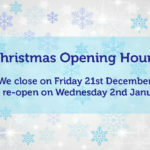 We close on Friday 21st December, and re-open on Wednesday 2nd January. Whilst we're away we'll try our best to respond to your emails. Don't forget you can still order your fabric through the website over Christmas and New Year. Any purchases placed over the festive period will be processed when we return on 2nd January.